Green bean casserole is one of those dishes that's been around forever, and yet it's completely modern -- it's basically the Tony Bennett of Thanksgiving side dishes. And like Tony Bennett's genre-bending oeuvre, no two iterations are the same. From an onion ring-laden twist to a cast-iron version from Alton Brown, this is how you take your casserole game to the next level. Many recipes of this ilk throw a bunch of cheese onto a pile of green beans and call it a day. And while that isn't a horrible idea, this vegan take on the green bean casserole includes cashew butter, mushrooms, and garlic. Sounds good to us. Recipe here. Do you have five spare minutes? Of course you do -- you're reading this. You can't get yourself out of making this recipe, then, because it involves mixing exactly four ingredients in a Crock-Pot and then doing something else while it heats up! Recipe here. Onions are a staple of green bean casserole recipes, but onion rings? Sadly, not a staple. But they'll be a staple of your Thanksgiving meals once you've tried them. Also, don't put staples in your food. Big mistake. Recipe here. The difference between panko breadcrumbs and regular breadcrumbs is simple: Panko is tastier. Granted, that's completely subjective, but make this panko-filled recipe and tell us we're wrong. Go ahead, try! Recipe here. If you want all the flavor of green bean casserole but are against using an entire can of cream of mushroom soup in order to achieve said flavor, this is the recipe for you. Also, you can say it's "just like mom used to make" even though we have no clue whose mom came up with this one. Recipe here. Ugh, this recipe is so cheesy. Just kidding, that was a fun play on words with the word "cheesy!" Though it is super-cheesy, in that it has 1.5 cups of Cheddar cheese in it. Recipe here. Some people don't mind scooping a big ole chunk of casserole onto their Thanksgiving plate, even while it spills out and touches other food. If you think food touching other food is gross, these little cups of green bean casserole will make you feel good inside. And if you don't mind... they'll still make you feel pretty good inside. Because they're delicious. Recipe here. The Pioneeer Woman is a famous blogger who has made a career out of her popular website and cookbooks. 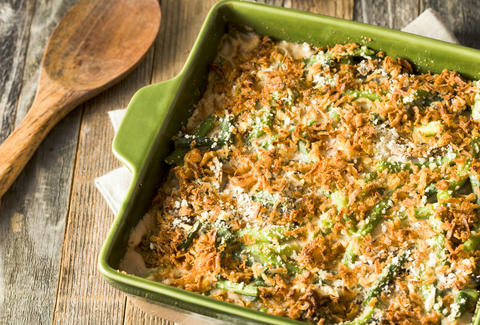 She added bacon and fried shallots to her green bean casserole recipe. She knows what she's doing -- she's a pioneer! Recipe here. It's funny to see such a classic recipe with a "2.0" in front of it like it's a new version of iOS. But hey, this is Alton Brown's recipe, and he does what he wants. And what he wants is to use a cast-iron pan to make green bean casserole. Recipe here. Lee Breslouer is a senior writer for Thrillist, and is eating a green bean as he types this. Follow him to Thanksgiving @LeeBreslouer.